I finally finished the gift I was making for my friend's birthday gift. She turned 50 a few days ago so I didn't finish it in time for the big day, but I'm not sure when we'll have a chance to get together anyway. I didn't want to mail it to her, but it may come down to that. 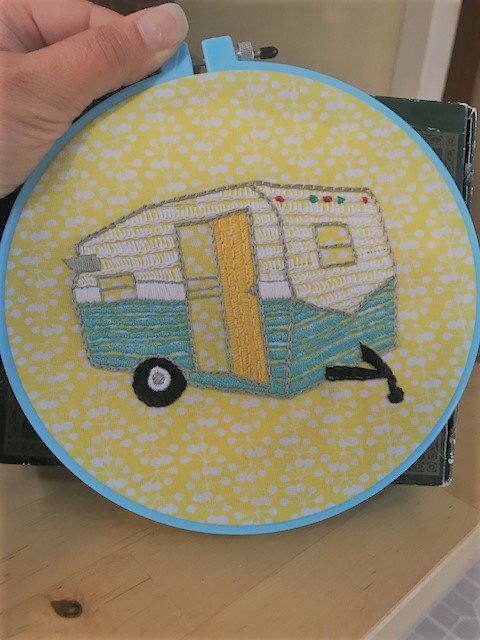 The work is finished, but I need to get a bigger hoop for the final frame. I thought I had one, but it's a 6" and I'd like to stick with the 7" size I've been working with. 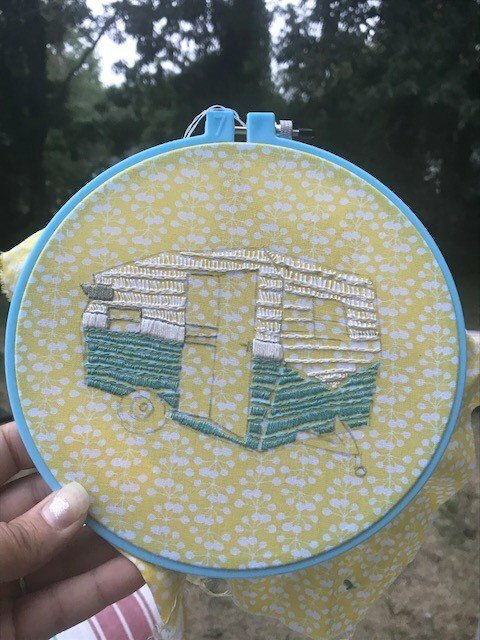 The beginning, once I sized and traced the original photo of her camper, I then used that image to trace onto fabric. 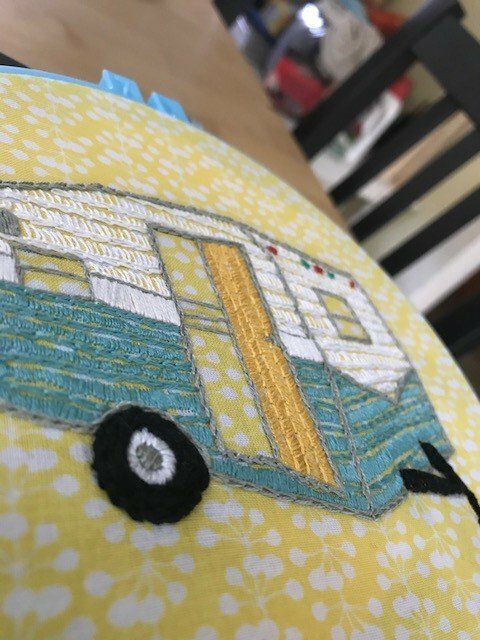 The inside of her Shasta is decorated in yellows and whites, so I found this cute quilters fat quarter for the background. 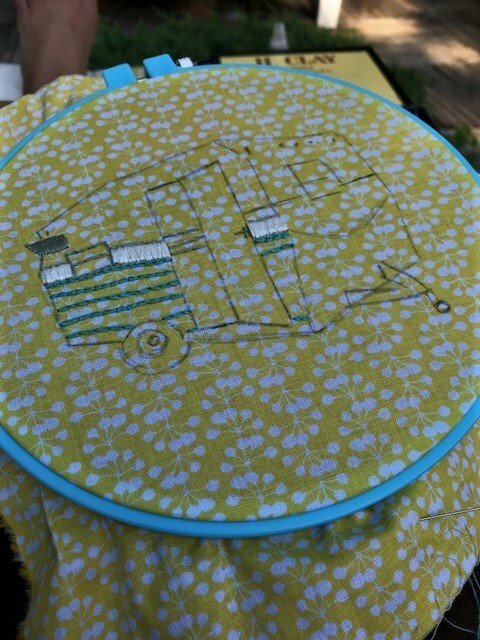 I slowly made progress, deciding on which stitches to use for each element of the design as I went. I only know a few, but I'be added a few more to my repertoire with this project. Day by day I chipped away at it, having put pretty much everything on hold this past week, other than work and trying to get my old dog feeling better again. 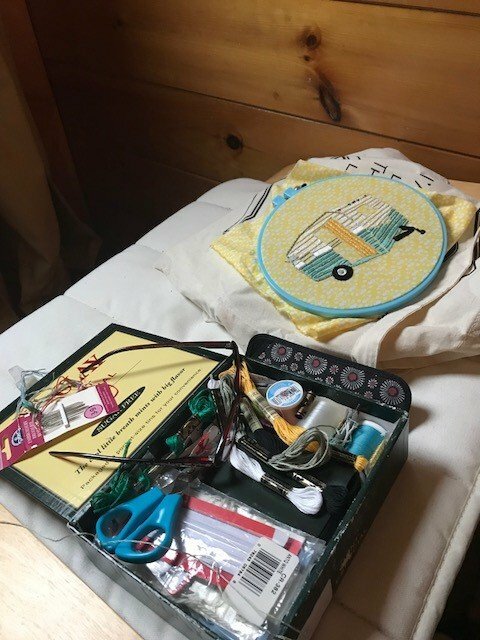 It is nice having a tidy portable sewing kit and just distracting myself with some stitching here and there. I have been trying really hard with my current work to be mindful of how the back of the piece will look. I am pretty happy with this one. Especially considering all the filler type stitches I had to use. I'm pretty happy with it. I like the way the new stitches I tried, worked out. 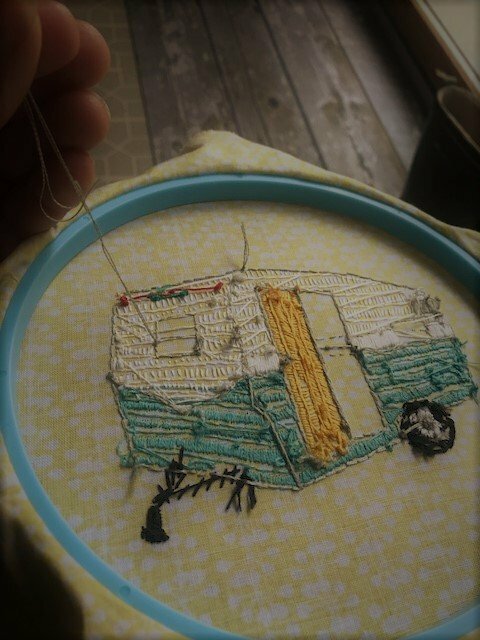 I am eager to decide on my next piece so I can practice these new stitches and begin learning more. This really turned out amazing and the colours are superb! Join us on Mondays for Creatives' Coffee Hour at 1pm EDT in the Steemit Ramble on Discord or view it live on Rambling Radio. Wow! I am so honored! I will read it straight away. I have yet to find time to figure out Rambling Radio and Discord, but it is on my to-do list!